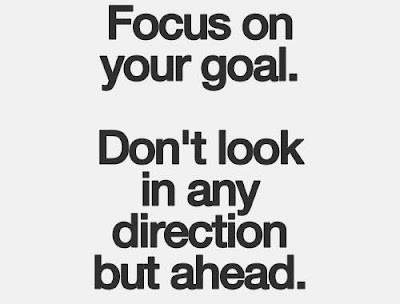 Monday Motivation | Focus. Focus. Focus. In 2016, I'd like to accelerate the time it takes to create massive results. In my limited experience, there's one key factor that has the ability to multiply results by 100% or more. This factor is what I would consider a success lever. A lever is basically a tool used to move a heavy object. Or a tool used to create an intended result. Today, most levers have been replaced by switches. We essentially flip a switch (or press a button) causing multiple operations to take effect. What if there were an internal button we could push that could cause intentions to manifest. If there was a button, or specific action, that could easily multiply your results, would you harness it? Would you make it part of your daily ritual? If there was one success habit I'd advise you to develop in 2016, it would be the ability to focus. I heard somewhere that we now have a shorter attention span than a goldfish. The average amount of time we focus on something before shifting our attention is 8 measly seconds. Basically, we have a hard time focusing on an idea or task long enough to bring it into existence. For the most part, I toggle between periods of heavy focus and times where my mind is all over the place. When I'm operating with an unfocused mind, I get behind on work, my house looks messy and I stop caring about my appearance. Basically, everything falls apart around me. On the flip side, whenever I cultivate the habit of nurturing intense focus, it takes little to no effort to accomplish massive results. I'll never forget the story I heard in a book on mindfulness where the author details the account of the time when he tuned a piano using all the focus he could muster. This type of work usually took him hours so he allotted for extra time because of the added attention to detail. He meticulously went through all the steps required to complete such an effort. And, at the end of his focused session, he was astonished to realize how fast he completed the task. Taking away all distractions allowed him to complete his work in a fraction of the time. Back when I had a desk job, I recall leaving for work at the end of the day feeling like I hadn't accomplished anything. Juggling a bunch of open projects without finding resolution was draining. I was stressed out and felt like I was drowning. The solution? Total and complete focus. I challenged myself to work single mindedly on a task refusing to change gears unless absolutely necessary. With my to-do list before me, I worked on one thing on my list until I could cross it off and move to the next. At the end of the day I felt stress free and filled with a feeling of accomplishment. The only problem was that I was done with my massive to-do list at around 3:30pm. Just like Thomas, I accomplished my intentions well ahead of schedule. If the ability to fully focus allows us to reach our task related results faster, imagine what effect focus has on our achievement long term. You can become one of those people who seem to always reach your goals with very little effort, or as the author puts it, "without a sense of struggle." This week, I encourage you to begin the practice of developing your level of attention. In a world of multiple distractions, cultivating focus will require conscious effort. All you have to do is be fully present with what is in front of you, or the goals you've set for yourself. If you feel overwhelmed when it comes to experiencing results, try mastering the art of focus and watch your intentions manifest right before your eyes. Your Pre-Night Out Perfect Skin Ritual (part 1).